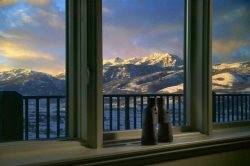 Cascades #404 is a 4 Bedroom / 3-1/2 Bathroom Luxury Townhome located in Eden, UT in the beautiful Ogden Valley and Wolf Creek area. Located 15 min. from the World Famous Snowbasin Ski Resort and 10 min. below Powder Mountain, two of Utah's VERY BEST Ski destinations! 1). Luxurious and very comfortable furnishings / beds! Fireplaces throughout including master with King sized bed, flat screen, very romantic. This is a very unique upgrade. 3). Private, large home theater that is literally the size of a two car garage. Furnished with top of the line, leather, reclining chairs - 8 total. 4). Flat screen, HD TV's with Dish Satellite in all the rooms - 7 total. DISH Network, 120 channels! 5). Free WIFI wireless internet - high speed, + available computer and printer so you can print your boarding passes. 6). Kids area downstairs with Playstation 3, connected for Netflix, Foosball table, video golf game, lots of fun available. 7). Two mountain bikes available in the garage for your enjoyment, Gas BBQ on the deck. 8). Gourmet kitchen (owner is a gourmet chef), large capacity crock pot, mixer, blender, Keurig coffee maker, spices, etc....very well stocked! Thank you for looking at Cascades Unit 404. Guests Provide Their Own Meals Absolutely NO SMOKING, Children Welcome: Game room with Playstation 2, Pets Not Allowed Bedrooms: 4 Bedrooms, Sleeps 12. Games: game closet includes: Monopoly, Jenga, Connect 4, and more...4 jigsaw puzzles!! Stereo: Sony Bluetooth music player.